The latest addition to the Award winning XRS Range is this perfect XRS SHORT METHOD FEEDER ROD. This 10ft rod has been described as the Mighty Atom. The ultra-light slim blank totally deceives its hidden strength and ultimate power this rod offers. The Purpose design and build features incorporated in this blank, is nothing short of astonishing. We have used our very own XRS (Xtra re-enforced system) Technology, that gives this little rod such a hidden strength that longer heavy feeder rods would be so proud to have. Designed for use on both Commercial Fisheries and still waters for short/medium casting work up to islands and Rushes etc. when using a Method Feeder full of groundbait, or equally when just using a straight bomb. This blank will enable you to cast accurately to features, when called into action, will assist you in controlling the fish quickly away from snags. 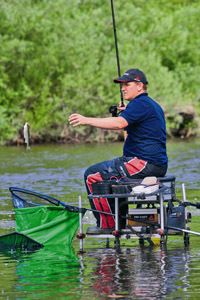 With the rod being only 10ft in length, it’s ideal to use on todays modern fisheries where peg spacing is at a premium. Supplied with 2 Interchangeable Glass Push over tips, 1.5oz and a 2oz c/w tip, each is colour coded for ID, giving you added versatility to adapt to any venue and conditions on the day. This is yet another quality XRS Rod that deserves its place in any Anglers holdall.